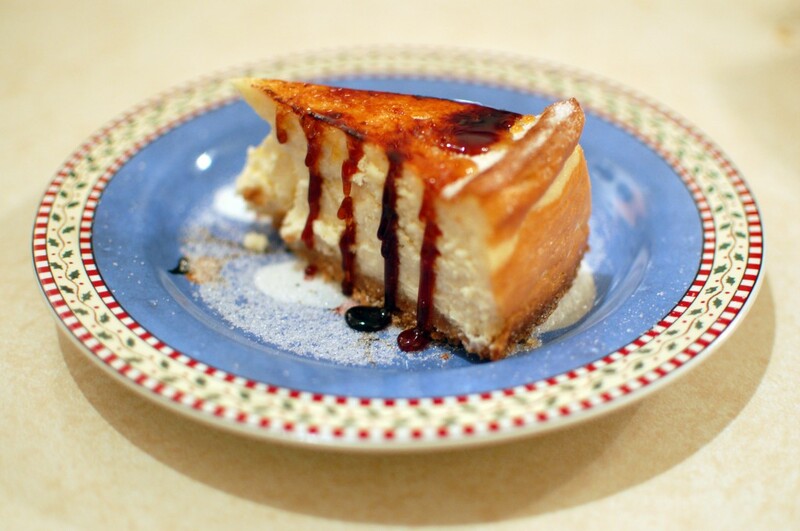 My brother was craving a very specific cheesecake that he and his fiancee last tasted five years ago while living in Omaha, Nebraska. 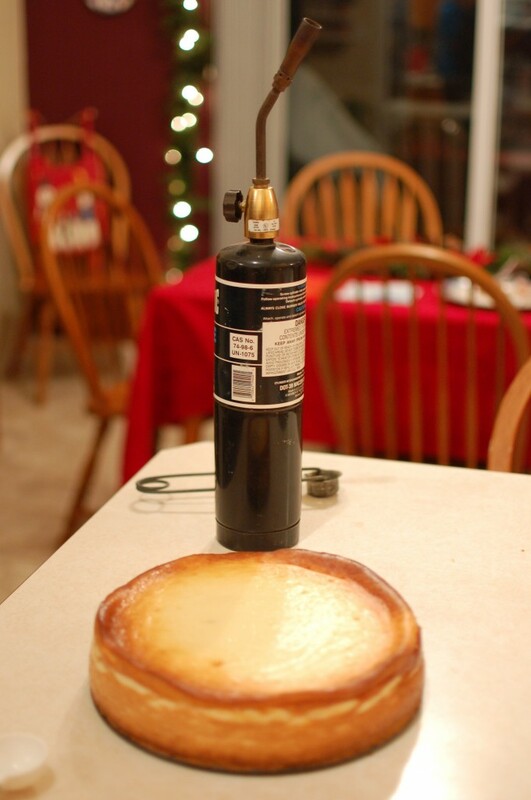 Upon hearing that my husband, Greg, has been making some amazing cheesecakes lately, my brother requested a homemade version of his long-lost creme brulee cheesecake for his fiancee at Christmastime. Though a cheesecake lover through and through (hence Greg’s new cheesecake-baking hobby), I’d never even had creme brulee before. How would I know if the cheesecake was successful? A field trip was in order! We headed to the French bakery and cafe La Bonne Bouchee (this is in St. Louis, where we celebrated Christmas Eve) and picked up several creme brulees and a few slices of cake. Yum! I was totally put off by egg-laden creme brulee ever since eating a delicious-looking treat at dim sum in Chinatown only to find that it was not sweet, creamy goodness, but straight egg-iness. Eww. Fortunately, creme brulee was not like that, and I rather enjoyed it. Whew. 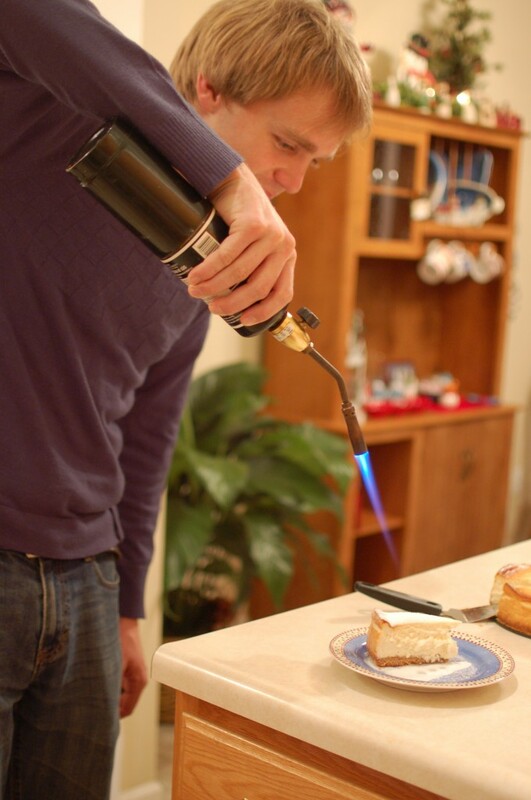 Greg did all the research on creme brulee cheesecakes and concluded that to get the crackly topping, you could either broil the cheesecake or use a torch. The torch method was strongly preferred. 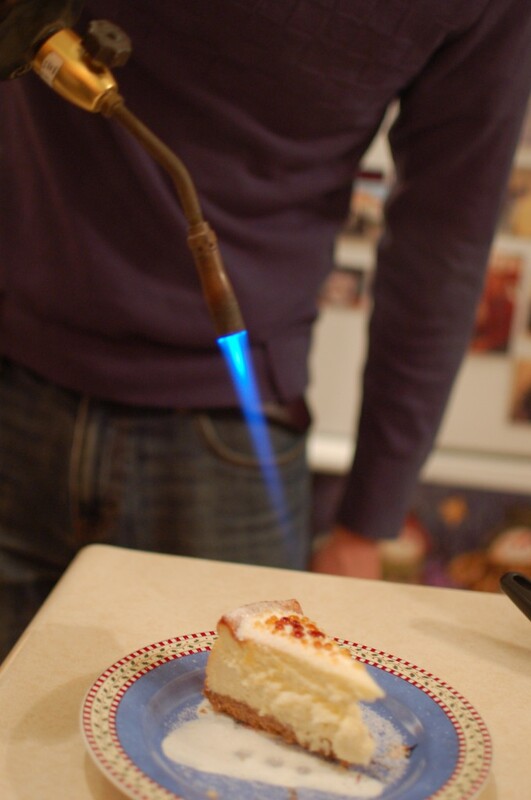 This is when I asked my dad if he had a blow torch we could use on cheesecake and he, after a brief hesitation, answered that he could probably “put together something that would work.” And that’s when I started worrying that we’d blow up the kitchen with my dad’s jerry-rigged torch. We (Greg, mostly) made the cheesecake, but not without minor mishap. The timer got accidentally turned off while the microwave was in use. Oops. The cheesecake still made it out okay, with Greg employing all the standard anti-top-cracking methods: dish of heated water in the oven, no opening the oven door, keeping the cheesecake in the oven for a few hours after cooking, etc. To toast the top, we actually managed to find directions from the very restaurant where my brother first sampled creme brulee cheesecake. (We were just hoping to find a photo!) 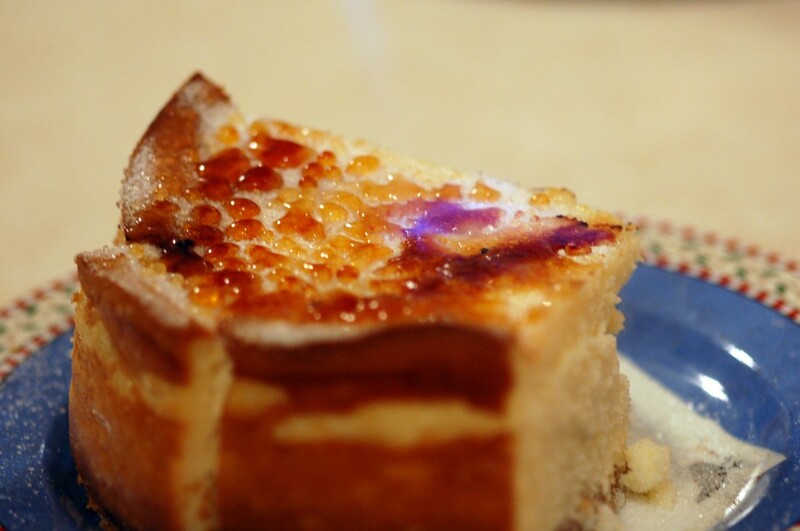 At Firebirds Restaurant, they brulee by the slice, sprinkling about 2 tablespoons of sugar evenly over each piece and then slowly heating it with the torch. Greg only used about 1 tablespoon per slice and found it to be plenty. 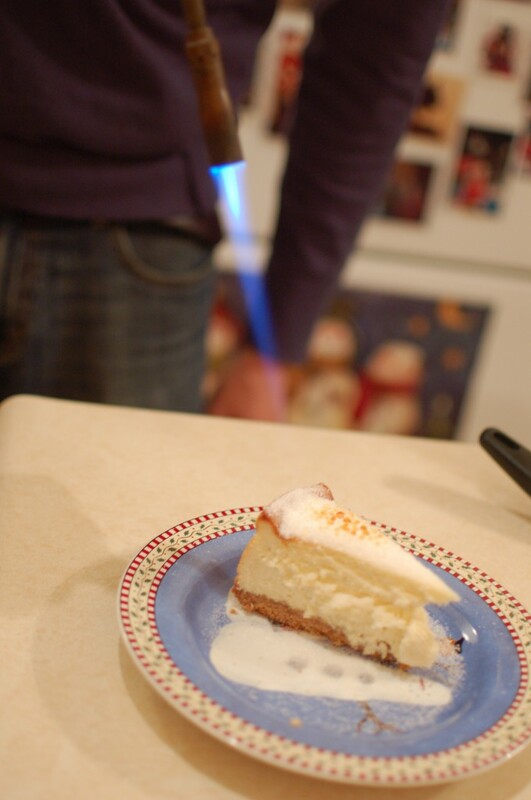 After sprinkling the sugar over the slice of cheesecake, begin heating with the torch. Start far away and move in slowly, keeping the heat moving so as not to burn a spot. As the sugar heats, it will first bead up and then eventually melt together to make a smooth, even coating. To keep the topping nice and crisp, it’s best to do it as close to serving time as possible (as with regular creme brulee, the topping softens after sitting awhile). why o why have i never seen two of my favorite desserts combined into one? this looks like it was delish!!! It was! We’ll have to make it out here in LA sometime!